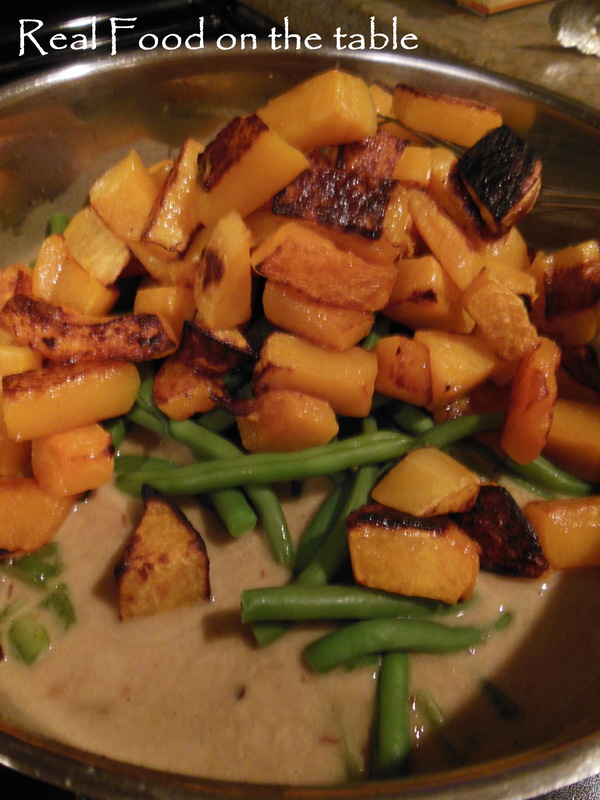 Let me first start with a little tip of my hat to one of my favorite vegetarian cookbooks – Vegetarian Suppers by Deborah Madison. I love this book and I think I’m pretty close to having made every recipe in the book. So recipes are great, but sometimes you just need to let your cupboards and refrigerator do the talking. In other words, interpret your recipe LOOSELY. 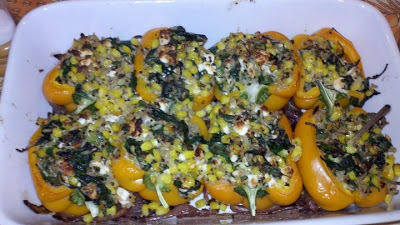 Last night I had planned to make this great recipe that Madison has for Yellow Peppers Stuffed with Quinoa, Corn, and Feta Cheese. I decided to go that route because I had 4 lovely orange peppers sitting in the fridge. 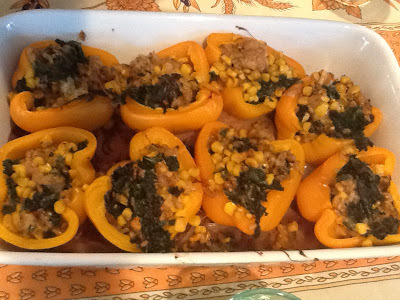 I hadn’t really inventoried the other ingredients I would need, but let’s just say that the substitution of orange peppers for yellow ones wasn’t the only recipe tweak I ended up performing. Believe me when I say that people who review recipes and then proceed to tell you that they changed every living detail about the recipe really annoy me. But sometimes you gotta do what you gotta do just to get dinner on the table (side note to those recipe reviewers – – – it’s simple, improvise however you need to, but just skip the whole reviewing thing as a favor to us all). So here’s the recap of how this meal came together. I’ll give you the real recipe at the close of the post. 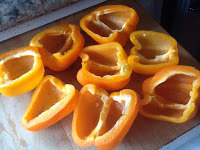 Start by cutting the peppers in half, removing stems and seeds, and then putting them in a pot of simmering salt water. 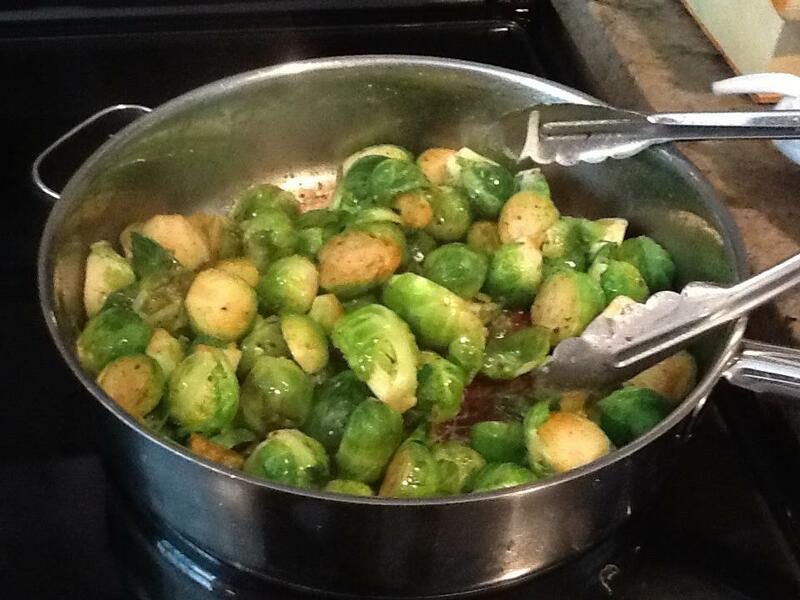 Let them cook 5 – 8 minutes until they are tender to the touch of a knife, but not too soft. Slice the onions into thin rounds. In a skillet, warm 1 Tbsp. of olive oil. 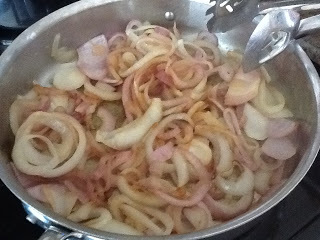 Add the onions and saute until they start to brown. Deglaze the pan with wine (or sherry as I did) and stir the onions as you do. 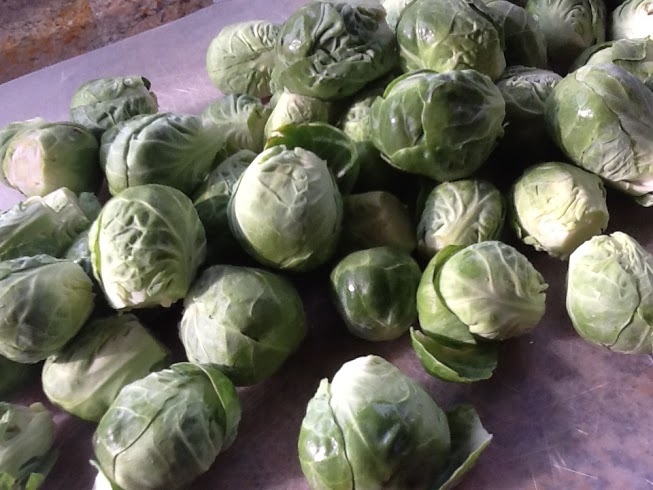 Season with salt and pepper, and then spread the onions in the bottom of a 9×13 casserole dish. Place the peppers on top of the onions. In another skillet, warm 1 1/2 Tbsp. of olive oil. 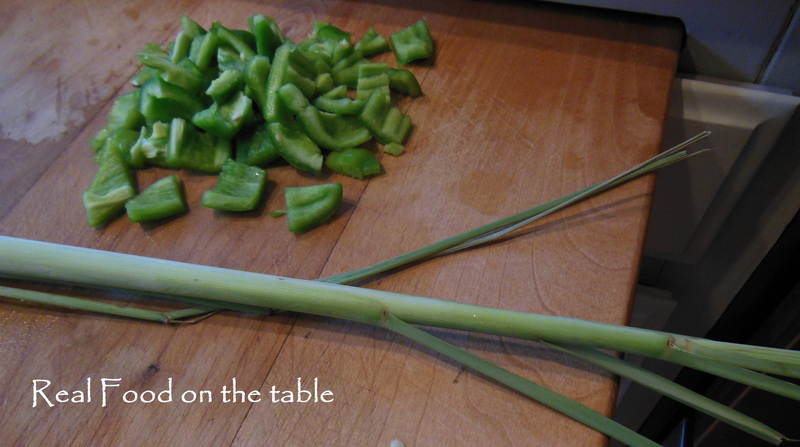 Add the scallions and Jalapeno (if you have it). Cook for about 2 min. 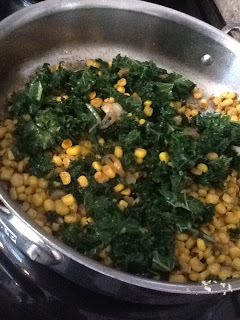 and then add garlic, cumin, corn, and spinach (or kale), and 2 Tbsp. water. When the greens are wilted (kale will take longer than spinach), add cilantro, quinoa (or rice), and cheese. Toss everything until well blended, and season with salt and pepper. Fill the peppers with the mixture. Drizzle 1/2 Tbsp. olive oil over them. Bake at 400 degrees for 20 – 30 minutes until they are heated through. 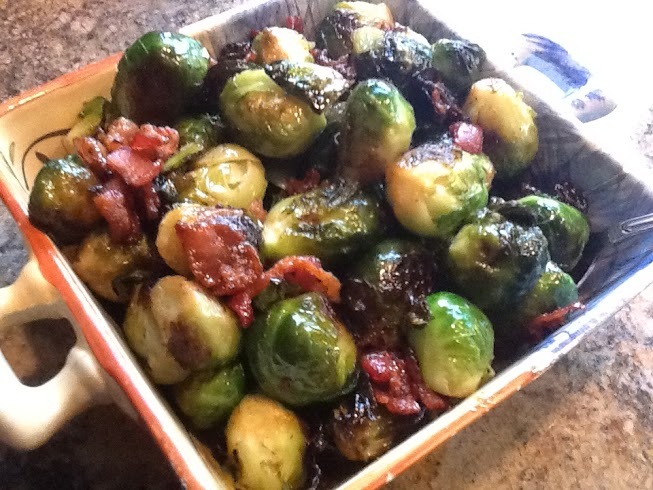 Switch to broil for the last couple of minutes to brown the tops. 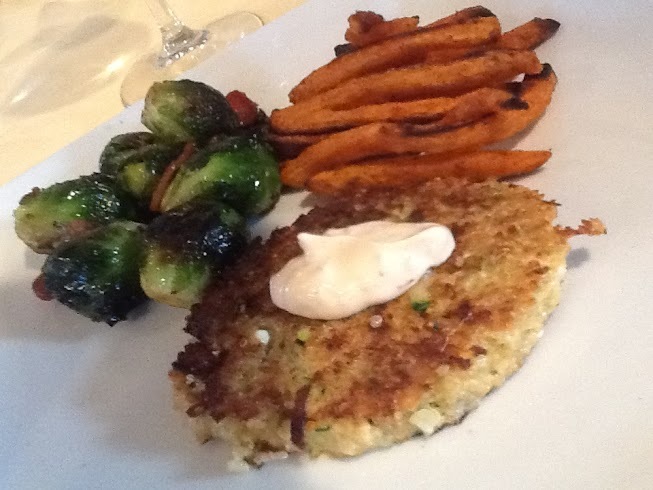 And here’s a picture from another meal, when I actually followed the recipe as written. My personal preference includes the feta cheese, just because I am such a fan, but I have to admit that the absence of whining was a definite upside to last night’s version. Wondering about the nutritional value of bell peppers? Definitely a winner for vitamin c and vitamin A.
I have to admit, I wasn’t a quinoa fan at first sight. I found it bland and a bit texture odd, and I’m all about the texture of food. But I had heard about and read about (http://www.livestrong.com/article/346908-what-are-the-benefits-of-eating-quinoa/) its great health benefits and so I didn’t give up on my quest for a palatable version of this great protein source. 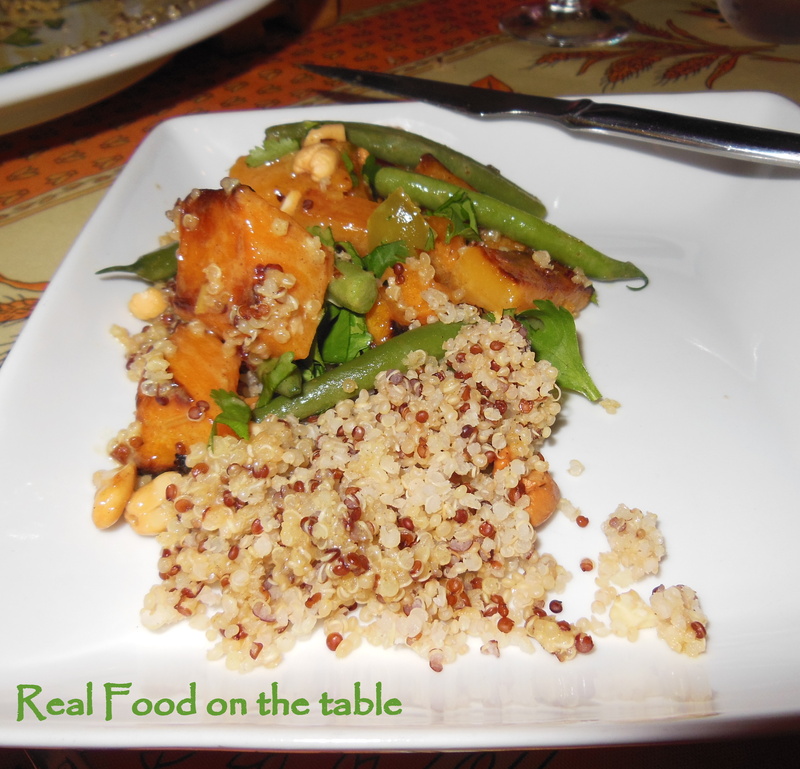 Well, I think we finally found it when I happened upon this inspiration recipe for a Crispy Quinoa Bake. To start with, you take the quinoa and rinse it thoroughly for 2 minutes. I’m not sure exactly how the rinsing ordeal affects the final texture outcome, but I’m convinced that it does have some impact on giving this dish a better texture. After rinsing it, you heat a couple of teaspoons of olive oil in a pan and then add the quinoa, stir a couple of minutes until it begins to dry and pop, and then add the veggie broth. 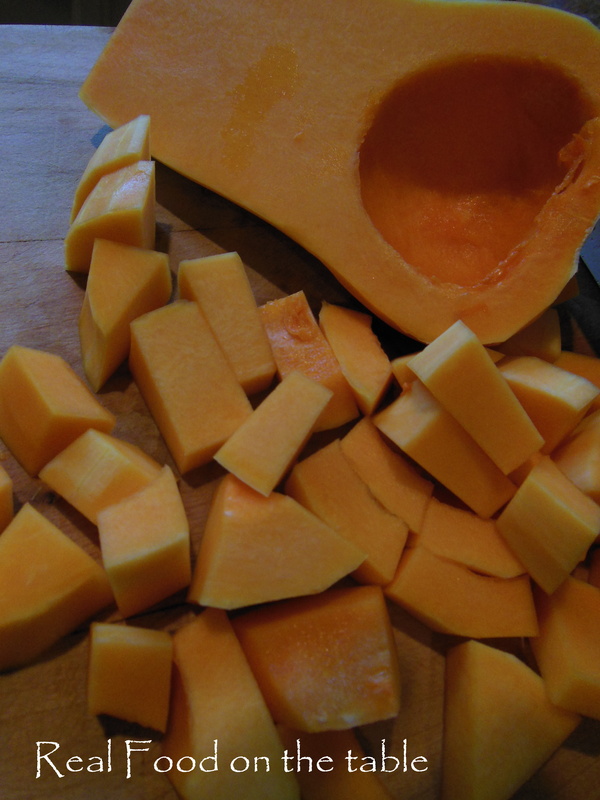 Cover it and simmer until all of the liquid is absorbed – about 20 minutes. While the quinoa is cooking, sautée one chopped onion and half of a chopped red pepper for about ten minutes. 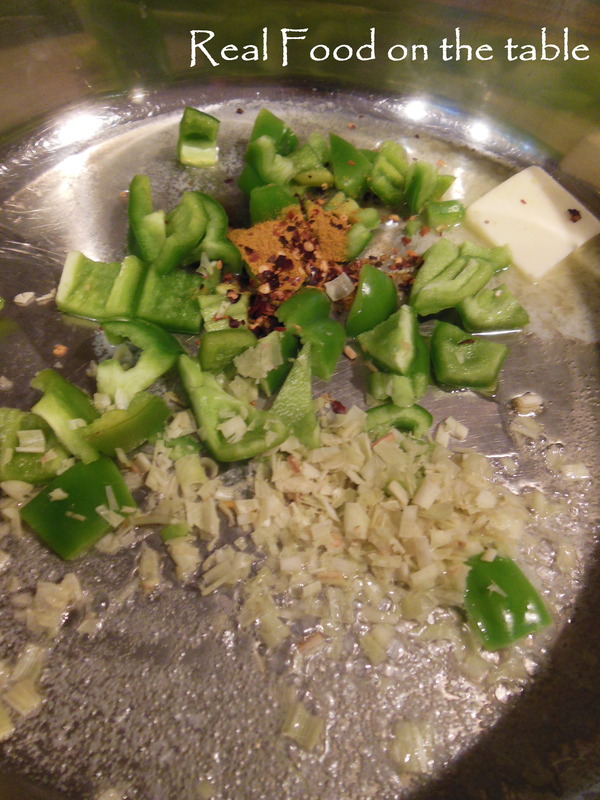 Then add in a clove of garlic chopped and a couple of medium zucchinis diced. Sautée for another couple of minutes. 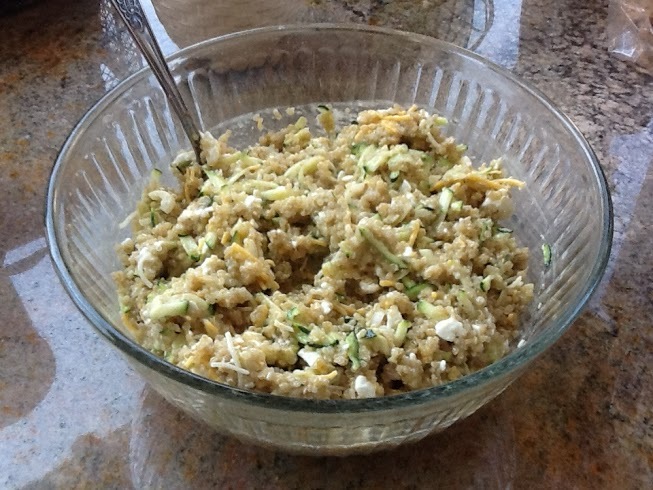 Fluff the quinoa with a fork and then combine the quinoa and onion mixture. To this, add black beans, diced tomatoes, frozen corn, green chiles, cumin, chili powder, and lime juice. 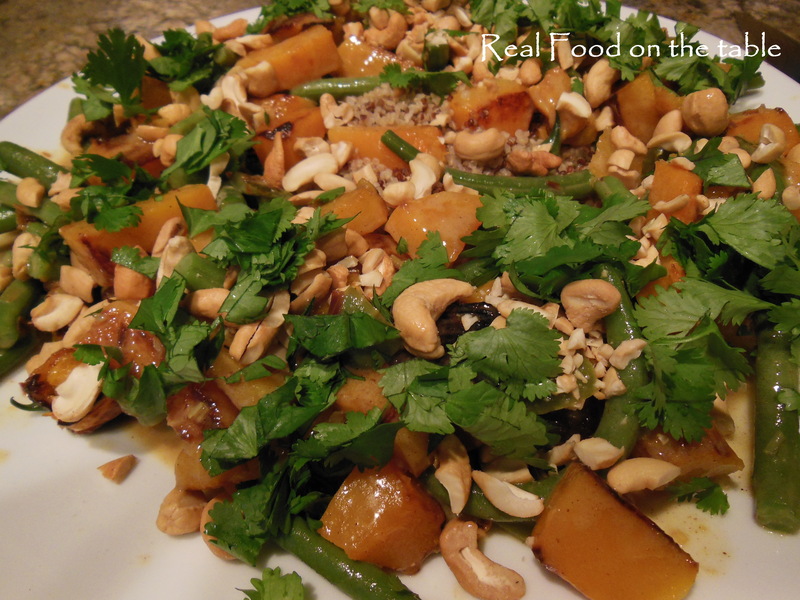 Once everything is well blended, place in a 9×13 casserole dish sprayed with oil. Bake the whole deal at 375 degrees for 30 minutes. Then sprinkle the top with grated Mexican blend cheese and bake for another 10 minutes until the top is golden brown. I think it’s great served with a little sour cream and accompanied by some corn bread and a simple green salad. This dish is also great because you can basically clear out the fridge with odds and ends and put them in the bake. I have added shredded carrots, kale, chard, brussel sprouts, and scallions to name a few.